A stunning Saturday in July and an absolutely perfect day for a wedding at Pioneer Lodge. The rustic log cabin overlooks the Elbow River and, on clear days, you can enjoy a beautiful view of the mountains to the west. We have been so lucky to have been part of several weddings at Pioneer and it is one of our favourite wedding venues in Calgary. We really enjoyed planning the menu with this couple. They wanted something fun and they wanted to treat their guests to a variety of hors d'oeuvres and food stations that blended tropical flavours with a Hawaiian bent (one of their favourite places to vacation) along with delicious summer BBQ fare. 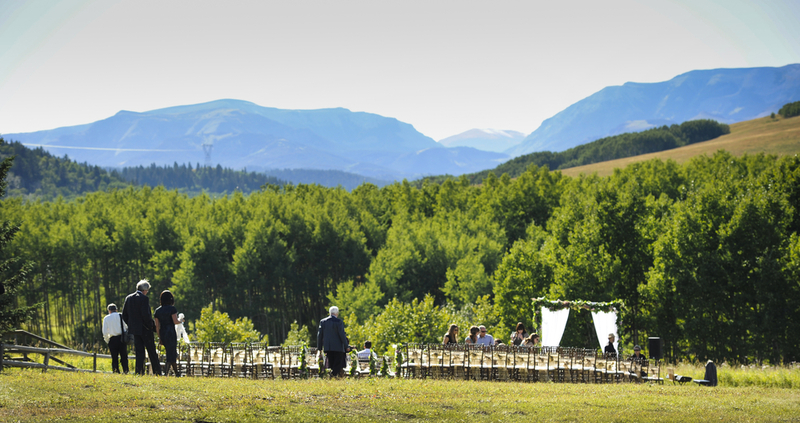 Calgary weddings don't have to be in Calgary - the surrounding foothills are stunning. Photo credit: Mark Eleven Photography Nothing is impossible. With know-how and creativity along with support from the amazing rental companies we work with, Devour can help you create beautiful outdoor ceremony sites and rustically elegant dining tents with breathtaking views of the foothills and mountains.